New Balance’s New York Fashion Week installation, “Real Time Exception Spotting,” combines surveillance and algorithmic technologies to celebrate and reward personal expression through style. But what does it mean for an algorithm to quantify individuality? And can surveillance technologies, despite possible banal contexts, ever be truly neutral? In conjunction with this year’s fall edition of New York Fashion Week and their own “Be the Exception” campaign, New Balance partnered with marketing giant VML to introduce an interactive digital installation called “Real Time Exception Spotting.” According to New Balance’s Director of Global Marketing, Allie Tsavdarides, the installation was intended to “celebrate individuals who are expressing themselves in independent and distinctive ways” in a context where there is “an incredible emphasis…[on] new trends” (New Balance). Positioned on a busy New York street, the activation incorporated surveillance and algorithmic image-processing technologies to analyze the fashion trends of passing crowds and identify individuals whose clothing choices deviated from the observed trends. When the Exception Spotting algorithm processes the exception, the identified passerby is magnified on the screen under the flashing label “exception spotted,” with an explanation of what made them stand out (i.e, “50% of people are wearing black tops, you are wearing indigo”) (Yan). Exceptions were rewarded for their individuality with a free pair of New Balance Fresh Foam Cruz Nubuck shoes. The New Balance installation is one of many examples of what the marketing industry calls “creative media advertising,” This strategy relies on creative forms of presentation to surprise and/or humor target audiences to distract from the content’s persuasive intent (Rauwers et al 1, 3). However creative, such campaigns are never separate from their economic interests. As New Balance sees it, the Exception Spotting tool “is a way to (hand out our) products to these people who already reflect what we stand for as a brand” (Segran). In other words, the project is a self-contained persuasive system: it rewards people for representing the brand without even knowing or trying, and convinces them that New Balance aligns with their own brand of individualism. While the Exception Spotting tool is a brilliant marketing campaign, it also raises some important questions about the continued datafication of our lives. According to scholars Mayer-Schönberger and Cukier, datafying something is to “put it in a quantified format so it can be tabulated and analyzed” (78). Despite countless examples of what can go wrong with data analysis, we continue to apply it to more facets of our lives, placing more and more trust in what we think it can tell us. We believe in its ability to “generate insights that were previously impossible, with the aura of truth, objectivity, and accuracy” (boyd and Crawford 663). Numbers can’t lie, right? We often fail to consider that data collection requires human intervention at all levels, from what we choose to collect to how we process it. In the case of image-processing algorithms, we have to train the algorithm to see things in the way that we want. Yet somehow, when our conclusions or categorizations are supported by data or processed by algorithms, it lends them a certain credibility or authority. New Balance’s installation, then, works under the assumptions that (1) individuality is something that can be observed and quantified and (2) certain expressions of individuality should be materially rewarded. What distinguishes this creative use of of algorithms from other experiments with algorithms and identity is its underlying corporate function. Not only is the Exception Spotting tool’s version of individuality quantifiable, it is also targetable and defined by its relationship to New Balance’s corporate ideology. It is the corporate situated-ness of this version of individuality that allows for an ideological consolidation of brand and the self that is supported by data and therefore legitimate. Scholar Irma van der Ploeg provides a useful framework through which to think about how technology can shape how we think about a concept ontologically. For instance, she argues that information technologies have encouraged us to see bodies as information in themselves, and less as “entities consisting of information” (van der Ploeg 179). I believe that New Balance’s Exception Spotting tool is a example of how even abstract concepts such as “individuality” can be datafied and in turn capitalized upon. For as much as the project celebrates individuals, it also targets them. 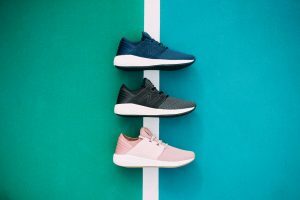 Identified “exceptions” are rewarded with a pair of New Balance shoes in that, if worn, will do some of the brand’s exposure work for them while also creating a relationship with the potential customer. This connects to broader shifts in the advertising world in which brands target specific customers in order to establish a relationship that will hopefully generate returns (Turow and Draper 140). When practices of datafication and corporatization continue to involve more abstract concepts, the concepts are stripped of their complexity and subjected to the influences of the market. Also tied into corporate utility of “Real Time Exception Spotting” is its use of surveillance technologies. However, this isn’t the fear-inducing, discipline-and-punish surveillance associated with the governmental gaze. On the contrary, this is “fun” surveillance that gets you a free pair of shoes! For me, the most interesting aspect of this project’s usage of surveillance is the discrepancy between its public face and private function. While the public face of the activation is centered around interactivity, celebration, and play, it maintains a private function as a market research tool. While the company promises that the surveillance “will not use facial recognition or collect personal data” (Segran), they do acknowledge that the observed trends will likely inform future designs (New Balance). What then do we make of the use of surveillance in this context? Can we consider it apolitcal because there’s no personal data involved or even be critique it, given it’s positive message? For me, the answer is complicated. While this kind of surveillance has a public face for positive ends, its dual function as a market research tool still situates it in the realm of a “broader financial and libidinal economy” that “targets valuable objects”—even if those valuable objects are celebrated (Elmer 28). At the same time, the spectacle and the interactivity of this public face is exactly what distracts us from the underlying economic function. What this dual functionality seems to offer then, is a model by which users of surveillance technologies may creatively conceal their agendas and resist outside speculation by projecting a more public-friendly appearance. But can surveillance technologies ever be truly separate from the market or from politics? Maybe if we all get free pairs of shoes, we’ll stop asking. boyd, danah, and Kate Crawford. “Critical Questions for Big Data.” Information, Communication & Society, vol. 15, no. 5, June 2012, pp. 662–79, doi:10.1080/1369118X.2012.678878. Elmer, Greg. “Panopticon–Discipline–Control.” Routledge Handbook of Surveillance Studies, edited by Kirstie Ball et al., 2012. New Balance. “New Balance Uses Artificial Intelligence to Celebrate How People Express Their Individuality during Fashion Week.” New Balance Press Box, 6 Sept. 2018, https://newbalance.newsmarket.com/latest-news/new-balance-uses-artificial-intelligence-to-celebrate-how-people-express-their-individuality-during-/s/97fd1746-4bee-49dd-ae59-8f742d058415. Rauwers, Fabiënne, et al. “The Impact of Creative Media Advertising on Consumer Responses: Two Field Experiments.” International Journal of Advertising, Aug. 2018, pp. 1–20. Crossref, doi:10.1080/02650487.2018.1480167. Segran, Elizabeth. “New Balance Is Watching You.” Fast Company, 29 Aug. 2018, https://www.fastcompany.com/90228083/new-balance-is-watching-you. Turow, Joseph, and Nora Draper. “Advertising’s New Surveillance Ecosystem.” Routledge Handbook of Surveillance Studies, edited by Kirstie Ball et al., 2012.
van der Ploeg, Irma. “The Body as Data in the Age of Information.” Routledge Handbook of Surveillance Studies, edited by Kirstie Ball et al., 2012. Yan, Michelle. “New Balance Used AI to Spot Trendsetters during Fashion Week — Did We Make the Cut?” Mashable, 7 Sept. 2018, https://mashable.com/video/new-balance-ai-fashion-technology/?europe=true#LbUW44nJoPqq.